Celebrate you special day with an exotic and unforgettable favor. 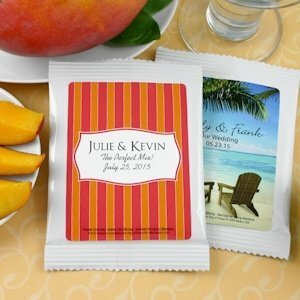 Our Mango Margarita party favors are available in a variety of fun and vibrant designs to coordinate with your theme. Each single serving drink mix comes in a white gloss pouch (4" x 5.5") with instructions and content printed on the back. Make them uniquely you with three lines of text. Easy Assembly with self-adhesive labels, or for an extra fee we will apply the labels for you.